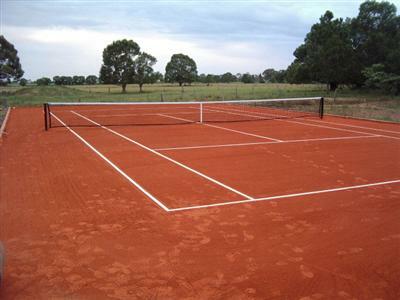 Clay courts are made of crushed shale, stone or brick. The red clay is slower than the green, Har-Tru, "North-American" clay. The French Open uses clay courts, unlike the other three Grand Slam tournaments of each year. Clay courts slow down the ball and produce a high bounce when compared to grass courts or hard courts. This is because clay courts have more grab and when the ball lands there is more friction pushing against the ball's horizontal path, therefore slowing it and creating a higher bounce. For this reason, the clay court takes away some advantage of big serves, which makes it hard for serve-based players to dominate on the surface. Grass courts are the fastest type of court in common use (AstroTurf is faster but is primarily only used for personal courts). They consist of grass grown on very hard-packed soil, similar to golf greens, which adds an additional variable: bounces depend on how healthy the grass is, how recently it has been mown, and the wear and tear of recent play. Points are usually very quick where fast, low bounces keep rallies short, and the serve plays a more important role than on other surfaces. Grass courts tend to favor serve-and-volley tennis players, such as John McEnroe and Pete Sampras among men and Martina Navratilova among women. The International Tennis Hall of Fame in Newport, R.I., comprises grass courts. The surface is less firm and more slippery than hard courts, causing the ball to slide and bounce lower, and so players must reach the ball faster. Serve and volley players take advantage of the surface by serving the ball (usually a slice serve because of its effectiveness on grass) and then running to the net to cut off the return of serve, leaving their opponent with little time to reach the low-bouncing, fast-moving ball. Players often hit flatter shots to increase power and allow the ball to travel faster after and before the ball hits the ground. However, Wimbledon, the most famous grass tournament, has slowed down its grass courts as early as 2001. Players have said that the courts of Wimbledon have become slower, heavier, and high bouncing . In 2001, Wimbledon organizers had changed the grass to 100% perennial rye in addition to changing to a harder and denser soil with both providing for a higher bounce to the ball. Grass specialist, Tim Henman, voiced out against this change in 2002 by stating, "What on earth is going on here? I'm on a grass court and it's the slowest court I've played on this year" . As a result, serving and volleying has become rare at Wimbledon and dominant baseliners such as Roger Federer have won the most recent titles. Grass courts were once among the most common tennis surfaces. However, grass courts are now rare due to high maintenance costs, as they must be watered and mowed often, and take a longer time to dry after rain than hard courts. For a more extensive discussion of the skills most advantageous on grass court, see grass-court specialist. Hard courts (usually made of asphalt) are the fastest type of tennis court, where fast hard-hitting players have a slight advantage. Hard courts can vary in speed; they are faster than clay and grass courts. Depending on the amount of sand added to the paint the amount the ball slows down can vary greatly. These courts are considered the most equal for all playing styles. 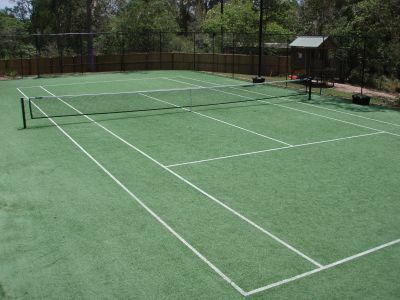 The U.S. Open is played on an acrylic hard court, while the Australian Open is played on a synthetic hardcourt. The main difference between a synthetic hardcourt and a true hardcourt surface is the level of hardness. When the ball bounces on this surface it is faster than all other surfaces if there is not much sand in the top paint. The amount of sand used in the top paint and the size of the sand also determines the speed—more sand means less speed and larger sand particles will slow the speed of play. The amount of friction can also be altered and more friction will produce a clay court effect, where topspin is magnified. The extra grip and friction will resist the sliding effect of the ball and the resistance will force the ball to change its rotation. The extra grip provided by the surface can resist the movement of the player and can cause injury. Specialized surfaces target varied needs. 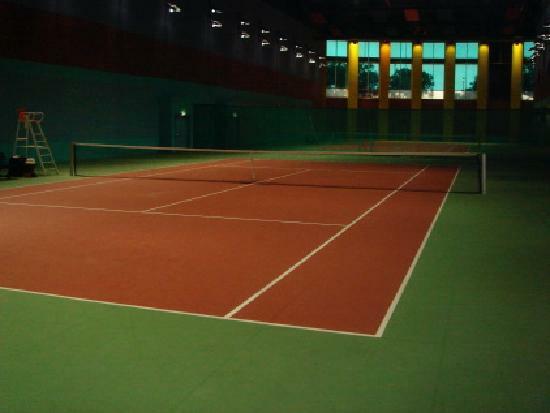 Carpet courts that are designed to be cushioning may only be suitable for indoor use. Low-maintenance options, such as plastic tiles, are good for both indoor and outdoor use. 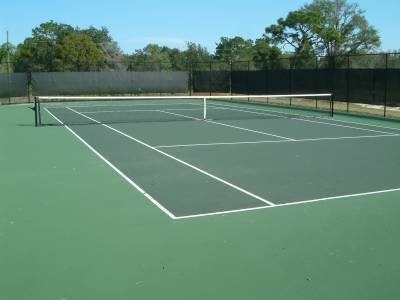 Wood is rarely used for tennis courts, perhaps because it makes the balls too fast to return. The ITF campaign Play and Stay aims to increase tennis participation worldwide, by improving the way starter players are introduced to the game. The campaign promotes to play in smaller courts with slower red, orange and green balls that give players more time and control so that they can serve, rally and score (play the game) from the first lesson.